By using or downloading any materials from this website, or by submitting an idea to Commercial Rowing Club, you are entering into this Agreement with Commercial Rowing Club and indicating that you agree to be bound by these Terms and Conditions. If you do not agree with these terms and conditions as stated, please do not use this website. The contents of this site are provided “as is”, and Commercial Rowing Club makes no representations or warranties, express or implied, of any kind with respect to this site or its contents. Commercial Rowing Club disclaims all representations and warranties, including, without limitation, warranties of merchantability, fitness for a particular purpose, title and non-infringement. Commercial Rowing Club does not represent or warrant that the information accessible via this site is accurate, complete or current. This site could contain typographical errors or technical inaccuracies. Commercial Rowing Club reserves the right to add to, change or delete its content or any part thereof without notice. Additionally, this site may contain information provided by third parties, which includes, without limitation, documents and software. Commercial Rowing Club makes no representation or warranty regarding the accuracy, truth, quality, suitability or reliability of such information. Commercial Rowing Club is not responsible for any errors, omissions, or inaccuracies contained in any information provided by such third parties. 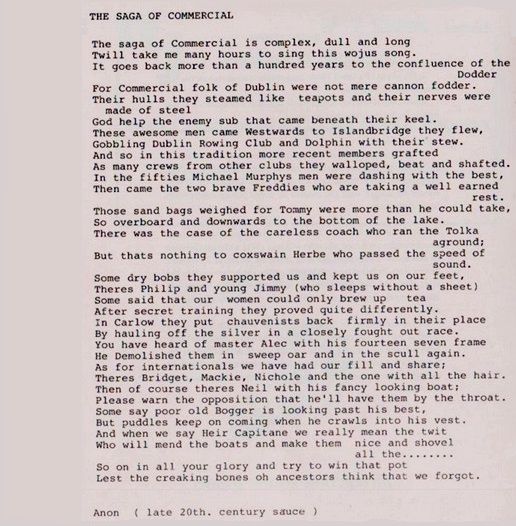 Neither Commercial Rowing Club nor any of its agents or other representatives will be liable for damages arising out of or in connection with the use of this site or any information contained herein, even if advised of the possibility thereof. This is a comprehensive limitation of liability that applies to all damages of any kind, including, without limitation, indirect, special and consequential damages, loss of data, income, profit or goodwill, loss of or damage to property and claims of third parties. You have sole responsibility for adequate protection and backup of data and/or equipment used in connection with the site and will not make any claim against Commercial Rowing Club for lost data, re-run time, inaccurate output, work delays or lost profits resulting from the use of the materials.Under no circumstances will Commercial Rowing Club or its agents or anyone connected with it be liable to you in any way whatsoever including for any indirect, incidental, consequential, special or exemplary damages arising out of or in connection with use of any idea that you submit to Commercial Rowing Club. Copyright holders will not be liable for any direct, indirect, special or consequential damages, loss of data, income, profit or goodwill or damage to property arising out of any use of the materials or performance or implementation of the contents thereof. Any other web sites that are accessible via any link on this site are not under the control of Commercial Rowing Club. Where our site contains links to other sites and resources provided by third parties, these links are provided for your information only, and the inclusions of any such link on this website does not imply Commercial Rowing Club ’s endorsement of the site, the organisation operating such site, nor any products or services of that organisation. Your linking to any off-site pages or other sites is entirely at your own risk. We have no control over the contents of those sites or resources, and accept no responsibility for them or for any loss or damage that may arise from your use of them. You agree to defend, indemnify, and hold harmless Commercial Rowing Club, its agents and affiliates from and against any claims, actions or demands, including without limitation reasonable legal and accounting fees, alleging or resulting from your breach of the Terms and Conditions. These Terms and Conditions represent the entire understanding relating to the use of this site and prevail over any prior or contemporaneous, conflicting or additional, communications. Commercial Rowing Club shall have the right to revise and modify the Terms and Conditions at any time by posting the revised Terms and Conditions on the Site. Any use of the Site after such posting shall be deemed to constitute acceptance of the revised Terms and Conditions by the user. Please email us at info [at] commercialrc.ie with any questions you have about these Terms and Conditions.